Knit & Crochet patterns, videos, charts, and ideas. I designed this headband in the beginning of Spring. I videotaped myself making it but I was not able to upload, edit, convert, and write the pattern. So last week I started a week long process of working on my video and writing this pattern for all my loyal fans and followers to make them happy again (hopefully). When I was designing this headband I was fiddling with the waviness of the crocheted band in the style of "trial and error", along with some math and some common sense. Then I decided to use a fake flower as an adornment, instead of crocheting one. I kind of like it better that way. But if you do not want to purchase fake bouquet to use only one flower as an adornment, then you can crochet a flower instead. It is a great quick project. Could be done for party favors, or small gifts for anyone (who likes headbands) - especially if it is done from a beautiful and expensive looking (or even expensive) yarn. Enjoy and thank you for your support by visiting my blog and youtube videos. Dont forget to like, share and comment on any of my videos or patterns. Click HERE for Right-Handed Crocheters. Click HERE for Left-Handed Crocheters. 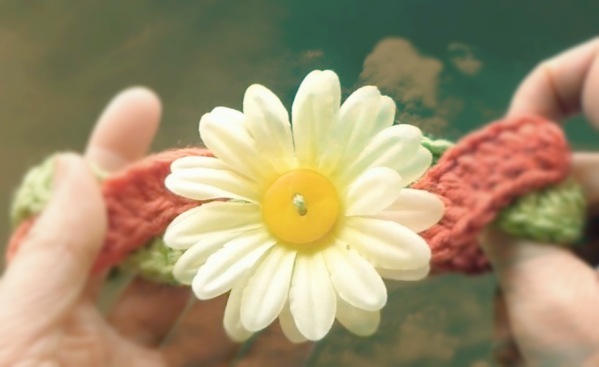 Click HERE for video How To Attach Fake Flower To A Headband. Happy crocheting ladies and gentlemen. 1 dc into 4th ch from the hook; 1 dc into next st; *[incr - 3x; 1 dc into next 2 sts; decr - 3x; 1 dc into next 2 sts]* - repeat (= total 4x if working with 56 sts; 5x if working with 69 st; 6x if working with 82 sts etc. ); make a knot, cut the yarn off leaving about 2-3 inches long tail. Sew ends of the Part 1 together, thus creating a circle. Make sure it is not twisted. Without twisting, wrap Part 2 around Part 1 so it looks like it is braided - the seams should be above each other. Sew a flower (either crocheted or fake one) at the seams. Watch my video for reference. Hugs to all happy knitters and crocheters. Please, before you COPY anything from Handmade-Rukodelky blog read THIS post first. Thank you. HandMadeRukodelky. Ethereal theme. Powered by Blogger.